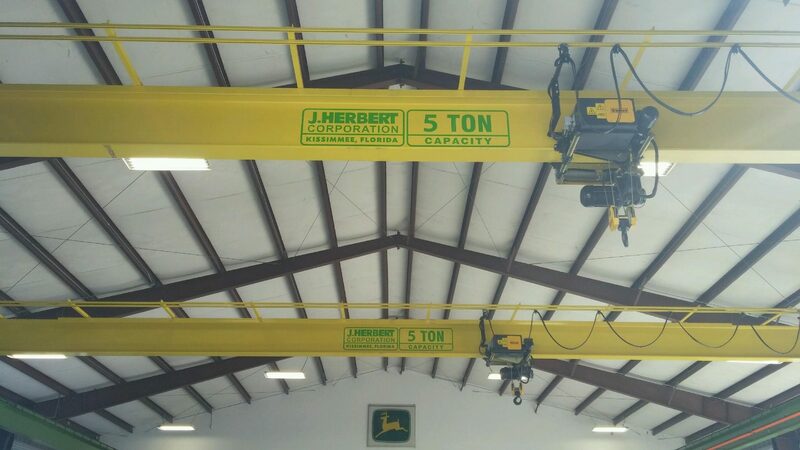 J. Herbert Corp is a full service crane manufacture. We are Woman Owned Small Business and we have been serving Florida since 1978. JHC builds, designs and installs overhead bridge cranes, monorail, gantry, and jib cranes. With full turnkey capabilities including design, manufacture, erection, parts, and service we are unique. We don’t rely on subcontractors for critical phases of a project. For our customers this means a single source of responsibility and full accountability. As a licensed General Contractor CGC 047549 we are qualified to permit even the largest projects. J. Herbert Corporation is a major distributor of several brands of hoists and accessories. We are authorized as new equipment dealers for companies such as Abell-Howe, Aeromotive, Anver, Budgit, Caldwell, Chester, CM, Coffing, Detroit, Duct-O-Wire, Electromotive, Harrington, Ingersoll-Rand, Insul 8-Conductix, Little Mule, Metreel, Motivation, R&M, Saturn, Shawbox, Spanco, Stahl, Street, Telemotive, Thern, Yale and more. We also carry a diverse line of OEM parts and accessories in stock. J. Herbert Corp. is your lift resource in the southeastern US. We specialize in sales, installation and service of a variety of material lifts including Scissor Lift Tables, Vertical Freight Lifts (VRC), Dock Lifts, High Capacity Lifts, High Travel Lifts, Turn Table Lifts, Work Platform Lift, Tilters & Tilt Tables, Vertical Ram Lifts, Bascule Bridges, Mechanical Lifts, Air & Pneumatic Lifts, Hydraulic Lifts, American Lifts and Custom Lifts. Air Hoists, Concert Hoists, Electric Chain Hoists, Electric Wire Rope Hoists, Lever Hoists, Manual Chain Hoists and Twin Hook Hoists. Geared Trolleys, Plain Trolleys and Powered Trolleys. Crane Refurbishment, Crane Runway Alignment, Load Testing, OSHA Inspections, Parts Sales, Hoist Manuals and Hoist Repairs.